Chernobyl death toll: How many cancer cases are caused by low-level radiation? 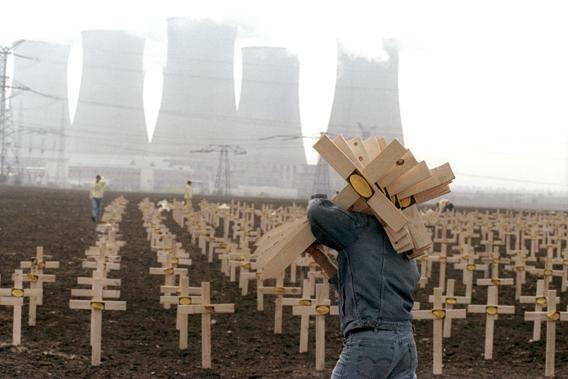 A Greenpeace activist carries several of 3,000 wooden crosses to be set up in front of the Soviet-built nuclear power plant in Bohunice on April 25, 1991, to commemorate the nuclear disaster in Chernobyl five years earlier. When the Chernobyl nuclear reactor exploded in 1986, experts predicted as many as 40,000 extra cancer deaths from the radiation spewed onto parts of what was then the Soviet Union. Friday is the 27th anniversary of the disaster. How many people has Chernobyl killed so far? We’ll probably never know. That’s partly because even 40,000 cancer deaths are less than 1 percent of the cancer mortality expected in the affected population. Statistically, the deaths are undetectable. Even if they weren’t, science usually can’t say that a particular cancer was induced by radiation rather than something else. One exception is thyroid cancer, a very rare disease in children that skyrocketed to nearly 7,000 cases in Belarus, Russia, and Ukraine by 2005. There is no doubt that radioactivity from Chernobyl caused them, including about a dozen fatalities. We also know that two people died in the explosion and more than 100 people, mostly firefighters ignorant of the dangers, received doses high enough to cause acute radiation syndrome. Of them, 29 died within a few months, followed by 18 more deaths over the years. The group seems to be at higher risk for blood cancers. Other than those sad cases, controversy rages about Chernobyl’s death toll. For the vast majority of the most affected populations, the disaster delivered doses equivalent to a handful of CAT scans. At such low levels, radiation’s health effects are considered long-term and stochastic, or essentially random. Like the atomic decay that creates radiation, which is impossible to predict for any individual atom, the health effects radiation causes are random, too. A given person who lived in the fallout zone might or might not possess a cesium-137 atom that is quietly mimicking potassium in some innocent cell. The atom might or might not release radiation that hits DNA and mutates it in such a way that might lead to cancer. The predictions of Chernobyl cancer mortality were based on formulas derived from studies of Japanese atomic bomb survivors. The formulas take the total amount of radiation the Chernobyl disaster released, smear it across the entire affected population, and multiply by a risk factor to come up with a number of deaths. Experts differ in the risk factors they use, but all the formulas assume that radiation’s long-term health effects—primarily leukemia, the cancer most commonly caused by the atom bombs—are directly proportional to the dose. They also assume there is no minimum threshold dose below which there is no danger. In the radiation exposure jargon, that’s called the linear no-threshold theory. As Slate’s Darshak Sanghavi has pointed out, the true health effects of low-level radiation can’t be known because any study to identify them would have to include an impossibly large number of people. Additionally, it isn’t clear that the effects of the intense, immediate radiation exposure from the atomic blasts pose the same dangers as do the low but chronic doses from Chernobyl. There is some evidence that cellular repair mechanisms can compensate for lower doses of exposure. For whatever reason, a predicted spike in leukemia cases in people exposed to Chernobyl fallout has not been detected. Given all the uncertainty, current estimates of the number of deaths caused by Chernobyl differ widely. In 2005, the United Nations predicted 4,000 deaths. Three years later, its committee on atomic radiation abandoned the linear no-threshold model for predicting Chernobyl cancer deaths from doses below the lifetime equivalent of four abdominal CAT scans because of “unacceptable uncertainties.” Critics such as Greenpeace responded with new predictions of 93,000 cancer deaths caused by Chernobyl. When evidence is lacking, people make a judgment call about whether to believe something that is theoretically possible but can’t be detected. In the case of cancer deaths from low-level Chernobyl radiation, the U.N. has decided that they don’t exist and linear no-threshold adherents have decided that they do. Neither can be proved right or wrong.